Size/shape: 6mm (long) x 4mm (wide) teardrops with the hole running through the long direction. 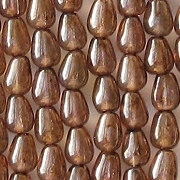 Colors/description: Clear beads with a mottle bronze- or gold-colored coating. Defects: The beads appear to be in good shape, although a small percentage of beads may not be perfectly shaped (variations in size or shape are common in very small beads). 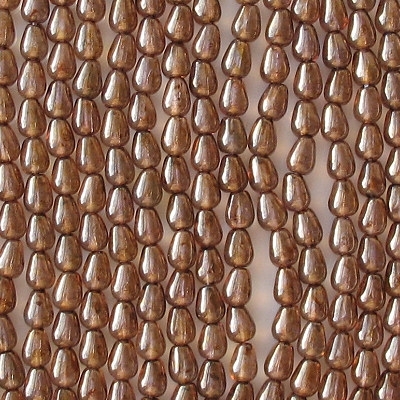 Comments: I struggled with whether to call these "bronze-luster" or "gold-luster" beads. "Bronze" implies a yellowish color, although bronze doesn't always look yellowish. 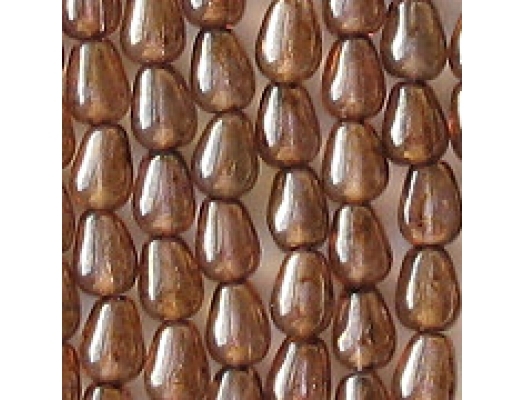 I suspect that all bronze- and gold-luster coatings are made with bronze, so I settled on "bronze-luster" to describe these beads. Curiously, the supplier calls this color "topaz lumi". That would imply that the inner bead is topaz, but I am sure it is clear. Please note that in very bright light, the beads may appear much brighter than my picture shows. I fixed up the picture at night, and under artificial light they looked pretty dark to me.